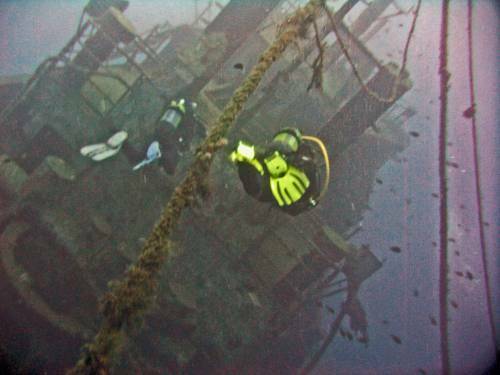 While diving the shipwreck Tabaiba you will spot occasionally pelagic UW life, barracudas, sardines and garden eels. This ship sank in 2006 and is excellent as a wreck specialty. Great dive site from a rocky shallows where one can off-gas and play with all the critturs. Great tech dive on the boat which is now showing signs of old age. Easy penetration to wheel house and the hold. Even get down into accomm with a squeeze. Great Dive Site access is feither rom an old public swimming pool at high tide (which is filled from a channel through the rocks) or by steps. Surge can make access and egress difficult. Swim out to the wreck following an old pipe which has anemones, cuttlefish and the occasional moray. The wreck is fantastic penetration to the wheelhouse and hold is poss but be wary of silt and sharp metal. Loads of interest for the experienced diver and a great decompress area of volcanic rock where you can off-gas and enjoy a myriad of fish including the cutest Blennies.